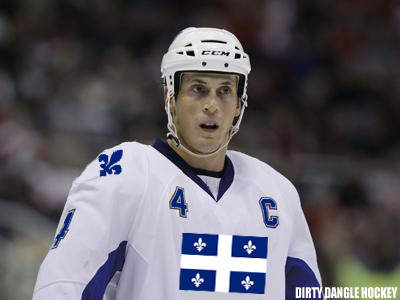 Dirty Dangle Hockey: What Would A Sovereign Quebec Hockey Team Look Like If They Separated From Canada? What Would A Sovereign Quebec Hockey Team Look Like If They Separated From Canada? Earlier this week, the sovereigntist Parti Québécois won the Quebec provincial election and of course sparked talks of Quebec separating from Canada as their own independent nation. This is a remote possibility as the PQ only have a minority government and a majority of Quebeckers aren't interested in leaving Canada. While there is a better chance of Scott Gomez winning the Maurice "Rocket" Richard Trophy next year than Quebec separating from Canada, it's fun to think about what a Quebec international hockey team would look like and how it would impact Canada on the international hockey stage. Burrows has been playing top line minutes on and off the past few years with the Sedin's, and has shown he can score posting 4 consecutive 25+ goal seasons. Lecavalier has been a bust in recent years, but is arguably the most talented of the group and would lead the team up not only up the middle, but as their Captain. St. Louis is a veteran playmaker who makes anyone around him better and the little waterbug would benefit from a larger ice surface to set up plays. Parenteau continues to improve every season and last year posted a career high 67 points - he is definitely top-six material. Bergeron is one of the best two-way forwards in the game and took home the Frank J. Selke Trophy this season for that honour; he would play big minutes for Team Quebec. Briere can easily slide over to the RW on this line and provide some clutch offence on the big stage (30 points in 2010 Playoffs). If Perron can stay healthy he would be a great third-liner on this squad as he is starting to develop into a point-per-game player. Desharnais exploded for 60 points last year and his little body is well suited for the bigger ice surface international tournaments bring. Ribeiro would have to slide to the wing on this line as Desharnais is the better face-off guy, and would provide the team with powerplays with extreme embellishment. All three of these guys would form a great fourth line with a strong physical presence and the ability to grind out some goals. Dupuis and Talbot are great team guys with excellent speed, whereas Lapierre would serve as the team pest and mouthpiece. Tanguay would bring a great deal of experience with him on the team and make those around him better with his playmaking ability. Letang would be the anchor on the blueline and relied on to play heavy minutes as not only the powerplay quarterback, but a staple on the PK. Vlasic would pair up nicely with Letang providing a duo that could be representing Team Quebec for many years to come. Robidas would be the most experienced defenceman on the team and would provide a physical game against opposing team's top players. Beauchemin would be able to chip in offensively from the backend, but his suspect defence (a minus player since 2007-08) could hurt the team. Bergeron would be mainly used as a powerplay specialist as his defensive game is a little weak, but he's been around the league for awhile now could bring a lot to the room. Gragnani is still young and has struggled to stay on an NHL roster, but there are slim pickings for a Team Quebec d-core so he's on the squad. Savard impressed in his NHL first season and would serve as the 7th d-man in case of injuries. Plus, the last name "Savard" would look so natural on Team Quebec. Brodeur would be there for veteran leadership and Fleury and Luongo would have to duel it out for the starting job. 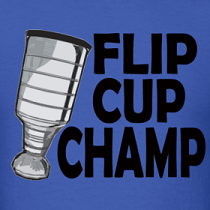 Luongo has the big game international experience, whereas Fleury has won the Stanley Cup. Team Quebec's goaltending would be their strongest position and hurt Canada the most in terms of lost players. Team Quebec would bring on Depres and Huberdeau for the grooming experience as they will be pillars of the team in a few years, whereas Gagne would be a great sub if the injury bug got serious and he himself was not injured. While Team Quebec won't be happening any time soon, they would still put together a solid team for competition, and would really only hurt Team Canada's goaltending which would still be great with Carey Price, Cam Ward, and Mike Smith remaining. Some decent players but not enough depth. I thought they'd be better. Mainly because I thought Giroux was from Quebec. That's some suspect D IMO. Giroux looks French to me. Those look like some goalies that'd be easy to rattle! Giroux est Ontarian. From Cornwall, on da border eh? Giroux is from Hearst, a small town in Northern Ontario halfway between Timmins and Thunder Bay on Highway 11 (it's pretty much in Ontario's geographic centre). I like the forward corps and the goaltenders, but you've missed quite a few defencemen. What about Jason Demers (Dorval) or Bruno Gervais? I think either of those guys gets to go ahead of David Savard and Simon Despres.